11. Type of light (Watt, color temp, how old, etc.) 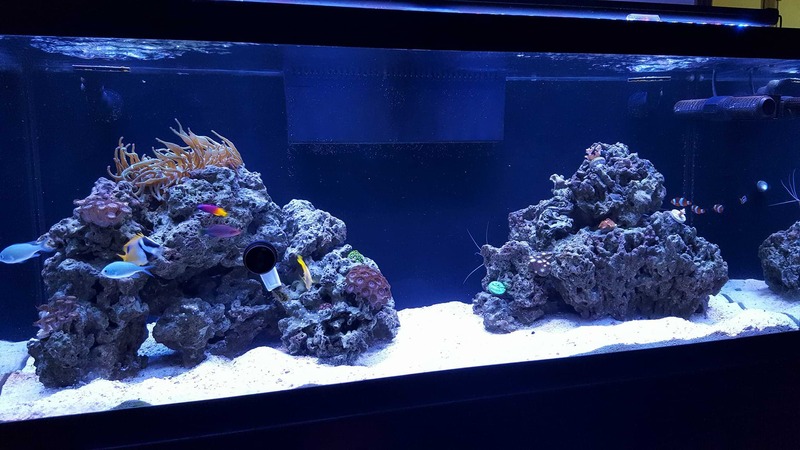 Current USA Marine Pro LED 92 Watt, one year old. Switching to Maxspect Recurve 120 LED 320 Watt this weekend. 16. Any supplemental dosing (type, amount, why, etc.) 2 part as needed. Not enough to use a doser yet. 18. Any present problems Spike in NO4 and PO3 this week. 19. Problem description (tissue loss tips, tissue loss base, diatom bloom, algae, etc.) some algae growth on rock work. Film algae on glass and sand has reduced. 20. What test kit do you use (how old, recently switched, etc. )Red Sea for ammonia, nitrite, nitrate, ph, calcium and magnesium. Hanna checker for Alkalinity and Phosphate low range. Milwaukee for salinity. 8 weeks, ZEObak 4drops 3x weekly, ZEOfood 4 drops 3x weekly, ZEOstart .8ml daily. 23. Which salt brand do you use - Red Sea blue bucket for the past 3 months. Before that Instant Ocean. I began the ZEO system 3 weeks ago. This past week I moved from daily dosing of ZEObac and ZEOfood to 3 times per week. My NO4 and PO3 readings since I started the ZEO system have read 0 and 10 respectively. Now tonight I have a reading of 6 and 20. Should I be seeing a spike like this? Should I return to dosing daily? For 9 months I didn't see much growth in my corals at all and couldn't get Chaeto to grow so decided to switch to a salt more in line with ideal perimeters and that had trace elements. In the last couple of months I've seen much better growth and the corals are looking much healthier, but still the Chaeto would not grow. 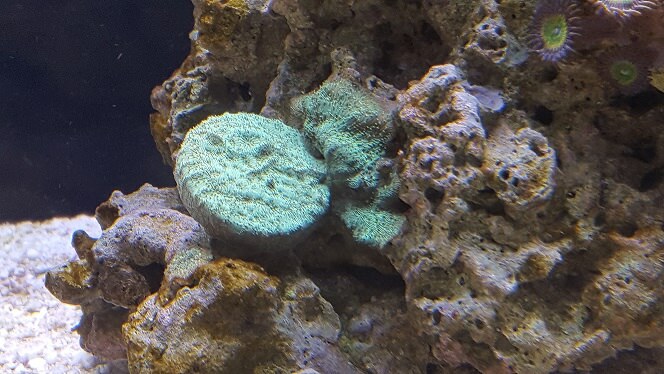 My system doesn't use enough CA and ALK to dose yet but I would like to add many more corals, both SPS and LPS but would like a stable system first. The reason for the increase of PO4 is that you have removed all the PO4 absorber which has controlled PO4 before in your system at once while starting ZeoVit. ZeoVit is a bacterial driven system which needs time to establish before it does process nutrients as expected. When you switch from PO4 absorbers to ZeoVit it is always better to start ZeoVit, and than start to remove the PO4 absorber slowly step by step over a couple of weeks. Can you please clarify about the PO4 level you have posted, is that 6 mg ? Please also measure the zeovit reactor flow and post the result. This can be done easy by collecting the water from the outlet for 30 seconds with a small container. Then multiply the water volume of it with 120 and you will get the exact output per hour. Do you run the reactor with continuous flow or do you use the on / off interval ? At the moment stop to dose ZeoFood, it will just improve algae growth in conjunction with the elevated nutrients. The PO4 is in a measurement of 6 ppb. As for the zeovit reactor, I have been running it continuously. It wasn't until I read the forums here that I realized it was supposed to be intermittent. I missed that in the instructions. The water flow through the reactor is 220 gph. If the measurments is ppb, that's very good range. You do not wsnt your po4 to actually be 0. Are you sure its 6ppb? What kit did you use? Hanna ULR phosphate checker. The face reads 6. Yes I see now. So it's 0.006 ppm. I'm used to using Hanna's PPM Phosphate checker and switched a couple months back to the ULR checker. So really not a spike in PO4. Thanks for pointing that out! So more or less just dealing with a spike in NO3 which isn't all that unusual for this tank. Unfortunately I am very limited on space in the sump and the room the tank is in. For a total net water volume of 100 US gallons I recommend to use 1 liter ZeoVit with a water flow of ~ 100 US gallons per hour through the reactor. The flow at the moment is to high and might experience issues with the corals after some time. if you are using zeovit I would highly recommend against marine pure, it will leach all type of stuff and will cause NO3/PO4 in the future. same for bio pellet, I have rarely seen success with mixing zeo and bio pellet. stick to the zeo system and be patience, we can treat each issue appropriately. how much rocks you have? 40 lbs of Pukani which I understand is very light in weight but extremely porous. Thia should be enough honestly. You just need to wait for the system to be established. How old is the system? Did you start with zeo from the start? Did you do 14 days cycle and followed it to the letter? That full tank image is prior to any algae issues. Unfortunately the tank is dark now so cannot get a full image. This picture was taken about a week ago and shows some the algae on the tops of the rocks. Most of the algae that was forming on the sand daily is gone as well as the film algae on the glass. Where I was having to clean daily I'm now going almost a week before it needs cleaned. Last edited by karo25; 03-05-2018 at 07:58 PM. Reason: Image too large.